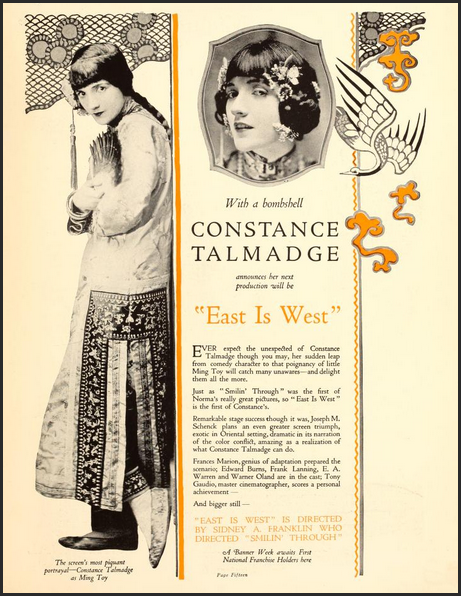 EAST IS WEST (Constance Talmadge Film Co., US, 1922) 70 min. 35mm (18fps), silent, b&w and tinted (reproduction through the Desmet color process), 1,436 meters. Director: Sidney A. Franklin; Producer: Joseph M. Schenck (for Constance Talmadge Film Co.); Screenplay: Frances Marion (based on the 1918 play East Is West by Samuel Shipman and John B. Hymer); Camera: Tony Gaudio; Art Direction: Stephen Goosson. Cast: Constance Talmadge (Ming Toy), Edward Burns (Billy Benson), E.A. Warren (Lo Sang Kee), Warner Oland (Charley Yong), Frank Lanning (Hop Toy), Nick De Ruiz (Chang Lee), Nigel Barrie (Jimmy Potter), Lillian Lawrence (Mrs. Benson), Winter Hall (Mr. Benson), Jim Wang (the love boat proprietor). Restored 35mm print with English (and some Chinese) intertitles. Source: EYE Film Institute’s Zaalberg Collection. 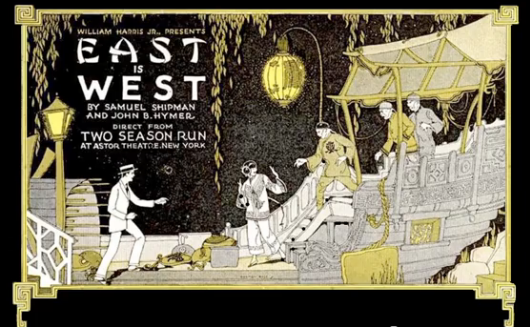 East is West, the outstanding Broadway success of 1918, written by Samuel Shipman and John B. Hymer with Fay Bainter in role of Ming Toy, ran for nearly two seasons at Manhattan’s Astor Theatre. In 1922, producer Joseph Schenck brought the story to the screen with Sidney Franklin directing, who directed Smilin’ Through. 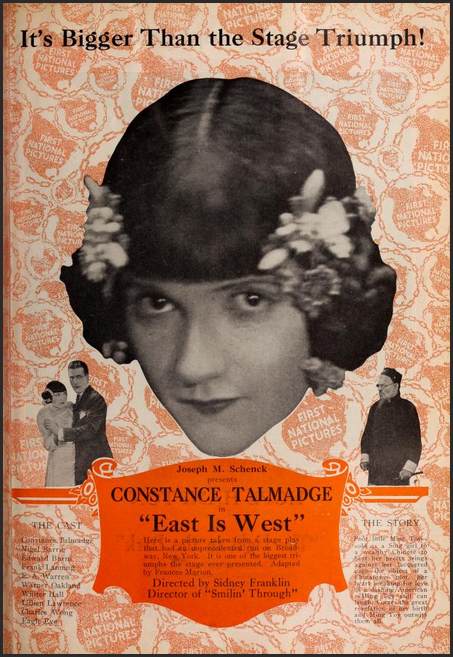 Constance Talmadge secured the coveted play, and is seen as Ming Toy, the lovely heroine. Talmadge crowned a meteoric career with her temperamentally brilliant interpretation of the role of this Chinese miss. Ming Toy, the eldest of Hop Toy’s many children, is rescued from the auction block by Billy Benson and sent to the United States in the care of Lo Sang Kee. There she continues her interest in western ways and attracts the attention of a powerful Chinatown figure, Charley Yong. When Charley Yong demands the hand of Ming Toy, she declines, causing disgrace to everyone involved. The supporting cast is made up of Warner Oland, the villainous Charlie Yong, Edward Burns, Nigel Barrie, Winter Hall, E.A. Warren, Frank Lanning, Nick de Ruiz, Lillian Lawrence and Jim Wang. In Los Angeles, the film appeared at the downtown Kinema Theater (672 S. Grand Avenue [demolished]). The film was never shown again in the U.S. and was considered lost. Then, at the end of 2005, the film was found at the Nederlands Filmmuseum in the collection of Jan Zaalberg, who collaborated regularly with restoration projects (The Chess Player  for example, came also from his collection, and was restored by Kevin Brownlow). In 2011, East is West (1922) was restored by The Netherlands EYE Institute of Film in Amsterdam Holland. This Labor Day Weekend, Cinecon 50 is pleased to host the U.S. premiere of the EYE Institute’s new restoration of East is West. Despite its A-list Hollywood star, producer, director, screenwriter, and cinematographer, East Is West was considered a lost film until a nitrate print from a private collection came to the Nederlands Filmmuseum in 2005. The initial inspection revealed that the first reel was in extremely bad condition, much of it crumbling into powdery chips. Nevertheless, a multi-year restoration was painstakingly undertaken. Approximately 400 feet (six minutes) of the decaying first reel were salvaged by step printing the delicate pieces. After duplication, none of the original film strip from reel one survived. The rest of the print was in relatively good physical condition and initially looked to be complete. However, further inspection revealed many narrative gaps, particularly towards the end of the film. Dutch release prints of East Is West were documented as being 2,364 meters long, meaning the surviving copy was missing more than 900 meters (some thirteen minutes of screen time). Access to the original shooting script helped fill the gaps in the story. The restoration, therefore, includes some explanatory title cards to provide a more complete narrative. Another restoration challenge was the print’s Dutch intertitles. The English-language release prints included pidgin English in many of the dialogue titles written for Ming Toy and others. The Dutch title cards have her speaking “broken Dutch” and her initial problems with the language are fundamental to the comedy plot. Rather than translating the Dutch back into pidgin English, this restoration used Frances Marion’s original script when possible. Where no original intertitles existed, the Dutch cards were translated in keeping with the style of the original American production. The result testifies to the great comedic talents of its stars, Constance Talmadge and the Swedish-born Warner Oland, who became famous as Charlie Chan in sixteen films before his death in 1938. Constance was a celebrated movie star, part of the Talmadge Sisters, alongside Norma and Natalie. By 1919, she had her own production outfit, Constance Talmadge Film Company, producer of East Is West and fifteen other silent features in which she starred until her retirement at the end of the silent era. The independently produced movie was distributed in the U.S. by Associated First National Pictures. Join fellow cinephiles at Cinecon 50, Labor Day weekend, August 28th to September 1st 2014, in Hollywood, California. For more information, please check out Cinecon’s website at: www.cinecon.org.